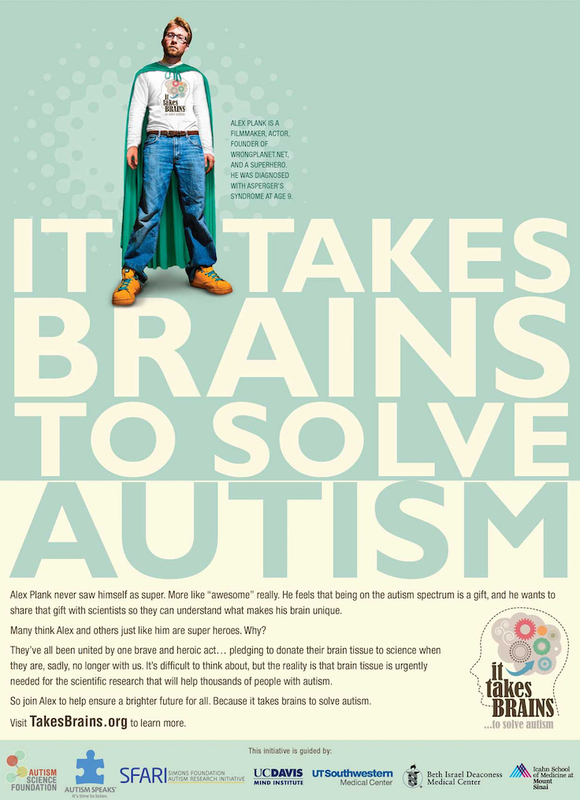 When I was first contacted by The Autism Science Foundation about being involved in the It Takes Brains campaign, I honestly didn’t know what to think. The campaign has the goal of urging families and individuals on the spectrum to “make the heroic decision to register for brain tissue donation.” It was certainly one of the least traditional requests I’ve ever received and it brought up things that I didn’t really want to think about, such as the fact that my brain would one day decide to retire and move to the tropics, or in this case, to a high-tech freezer. But after learning about the importance of the science, I was won over and agreed to become involved as a spokesperson for the campaign. There is an extreme shortage of brain tissue in the scientific community so this program is definitely essential. Over the last three decades of autism research, tissue from less than 100 autistic brains has been studied. I would like to personally encourage other individuals on the spectrum to make a pledge to donate their brains to science. Don’t worry, you won’t be donating your brain until you no longer need it, so there’s really no reason not to do it. You may wonder, as I did, why scientists need actual brain tissue. Shouldn’t tools such as fMRIs and EEGs be sufficient for most research? The answer to this question is no; Scientists are unable to study the full structure of a brain without having the actual physical brain tissue. Also, the only way to see how gene expression occurs in different parts of the brain is to study the brain tissue itself. These samples can help scientists understand the genetic functioning of brain cells, epigenetics, gene expression, and changes specific to neurons. The scientists also hope to gain a greater understanding of how our unique brain structures relate to the special skills we possess as autistics. Now, while donating your brain to science may seem like a bizarre thing to do, it’s actually becoming common place for people with unique brains. For instance, more and more professional athletes have been pledging to donate their brains over the last few years for concussion research. And I personally believe that those of us on the autism spectrum have much more fascinating brains than the average pro baller. Now you’re probably wondering what supporting this program entails. It’s actually pretty simple. All you need to do is register on the It Takes Brains Page. You can sign up as an individual with autism or even as a family member! You can also change your mind at any time if you decide that you no longer want your brain involved. But the best part is you can brag to all your friends that your brain is going to be flash-frozen in Carbonite like Han Solo in Star Wars (Autism Brain Net doesn’t use actual carbonite in this process, unfortunately, but the technology is still super cool and futuristic). Please follow my lead and make a pledge! Considering I’m already an organ donor, I wonder if the rarity of specimen brain tissue from AS donors stems from a lack of records. Yes. Most people don’t make the arrangements beforehand. Another challenge is that they need to preserve (i.e. freeze) the brain pretty quickly for it to be useful. So the idea is to donate it for research purposes? Always remember: cockroaches live many lives—if one leg is severed, another grows in its place–no prosthesis needed! Cool! I’ve always wanted to donate my entire body to science (as in, let med students practice surgeries on me, etc… I don’t need to be cremated or buried or anything.) I haven’t figured out how to do that, but this is a good place to start!